Spending time with my family is nourishment for both my soul and my body. I was blessed with a grandmother who at her core is a caretaker. Whether she is inspiring people with her positive attitude or cooking up a delicious homemade lunch in the kitchen, at 90, she is still an amazing provider to her family and friends. Although we may not be able to make everything from scratch like my grandmother, we can commit to small changes in our diets to keep our families and ourselves healthy. For example, we can work to remove high-fructose corn syrup from our diets. High-fructose corn syrup (HFCS) can be hazardous to our heart. A study done at the University of California studied 85 men and women who consumed beverages sweetened with different amounts of HFCS. Even beverages containing the smallest amount (10%) of HFCS increased LDL cholesterol and triglycerides, two well-known risk factors for heart disease. Many of you may say, “But I don’t drink pop,” or “I stay away from processed foods!” But do you know that HFCS sneaks into places where we least expect it, such as most of our store-bought sandwich bread? Be sure to read every label of packaged food that at the grocery store. I found several brands of bread that do not have HFCS added. They are soft to eat, and my kids report that they taste good as well. So if store-bought bread is more up your alley, try the following brands: Nature’s Own Honey Wheat, Nature’s Harvest Honey Wheat or L’Oven Fresh Honey Wheat. 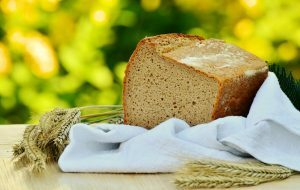 This recipe for homemade sandwich bread (adapted from Super Healthy Kids) is a great alternative to store-bought bread without the added High Fructose Corn Syrup (and other unnecessary junk). Plus, I had a non-baker friend test this recipe to prove that you don’t have to be a culinary wizard to whip up a tasty and healthy batch of bread! 1. In a stand mixer with a whisk or paddle attachment, combine water, oil & honey. 2. Add egg (if using). 3. Add 3 c. flour, yeast, & salt. Mix thoroughly. 4. Change attachment to the bread hook (kneading) attachment. Add remaining flour and set to mix on medium-low speed for 10 minutes. 5. Divide the dough into two parts and place into greased loaf pans. Let rise on the counter (covered or uncovered) for 30 minutes. 6. Preheat oven to 350. 7. Once the dough has doubled in size, bake both loaves in the same oven for approximately 30 minutes or until the tops are golden brown. Let cool 10 – 20 minutes, slide a knife around the perimeter of the pan, and flip over to release the loaf. I hope you enjoy this recipe. Let me know in the comments below if you try it out.